Osprey once nested and lived in Iowa, but no nests were recorded since the state was settled by Europeans. That is, not until a reintroduction of osprey was begun by the Macbride Raptor Center and the Iowa Department of Natural Resources in 1997. Why reintroduce osprey? With construction of lakes and reservoirs by the Iowa Department of Natural Resources (DNR), county conservation boards, private industry, and U.S. Army Corps of Engineers, potential osprey habitat exists today that was previously not available. In addition, osprey as a species have not been good at expanding their range, nor have young osprey moved into new territories. Minnesota and Wisconsin DNR officials suggested that ospreys, in our lifetime, do not readily pioneer new breeding ranges. 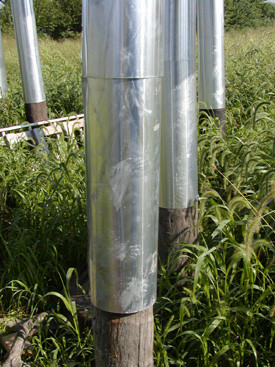 Instead, they experience suppressed reproduction as density of nesting pairs increase. Scientists have determined that a raptor population is in jeopardy of crashing, when the average fledging success of young per nest approaches 0.8 chicks/nest. To address this issue, young ospreys from Wisconsin and Minnesota have been relocated to areas with suitable habitat in the Midwest. Wildlife populations evenly distributed across suitable habitat will be able to withstand pockets with high contaminants that stress those populations. 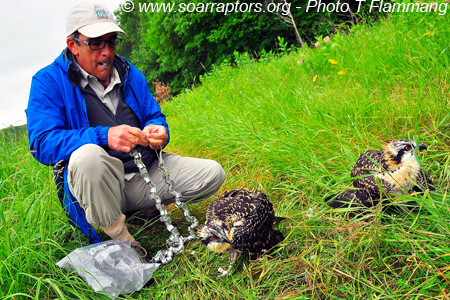 As biological indicator species, raptors reflect the health of our environment. 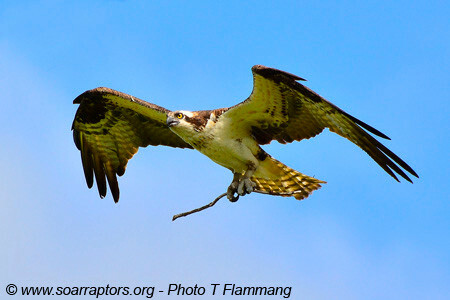 Three things about osprey biology help make reintroduction possible: Osprey can learn to fish without their parents, osprey can migrate on their own without parents, and once mature, males typically, return to where they were raised to build a nest and raise their young. For the reintroduction project, the Iowa DNR helps to obtain young osprey and work with local conservation agencies and volunteers to place the young birds in hack towers, feed and monitor them, in hope they will expand their range into Iowa. On the downside, only a small percentage of young osprey survive to even one year of age making it critical that enough young osprey are released (hacked here in Iowa) to have enough survivors that live long enough to nest! A 2011 banded osprey relocated from northern Minnesota to the Whiterock Conservancy osprey hack tower was spotted and photographed in Sioux City, Iowa in April 2015. 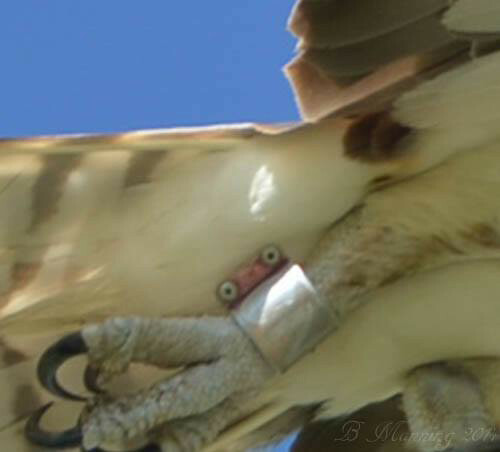 This female sports the Iowa osprey project purple band YU on her left leg and a silver USFWS band on her right. The “big deal” in sighting an osprey that fledged from the Whiterock tower, is this is the FIRST documented sighting of any of the osprey from that tower. YU was spotted with a male and the hope is that they are nest building in the Woodbury County area, possibly even where they were photographed! It took a couple days of photographing for SOAR volunteer Tyler Flammang to get enough evidence that this was indeed YU. The first days’ photos showed us the letter Y and the letter U but could not tell the order. 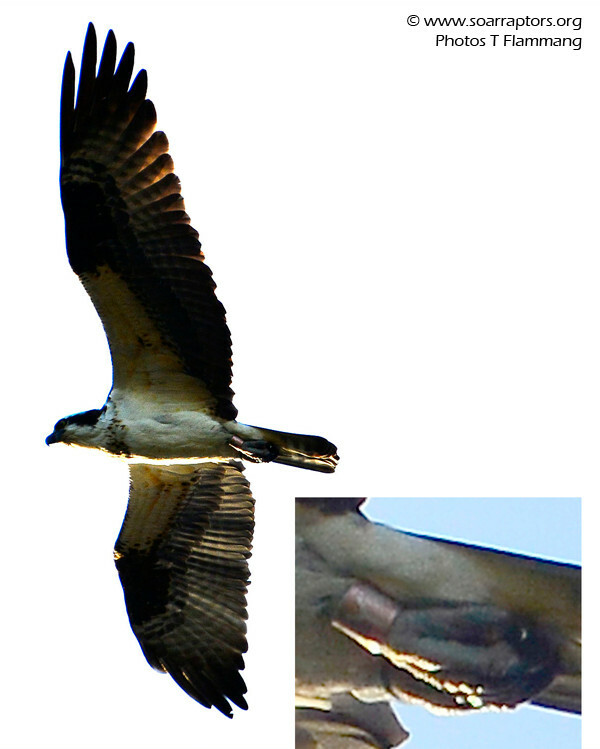 The next time Tyler photographed this osprey, one photo showed the crimp where the band is riveted together. The alpha identification is on both sides of the band and that crimp tells us what order. This Iowa-hacked osprey was photographed in Sioux City on 22 April 2015. You can see her purple project identification band and can see the letter 'U' on her left leg. What is the other letter or number? This Iowa-hacked osprey was photographed in Sioux City on 22 April 2015. You can see her purple project identification band and can see the letter 'Y' on her left leg. Seeing where the crimp on the band is confirms the order of the letters on the band. This is definitely YU. Between 1997-2014, 291 ospreys have been released at 12 sites in Iowa. 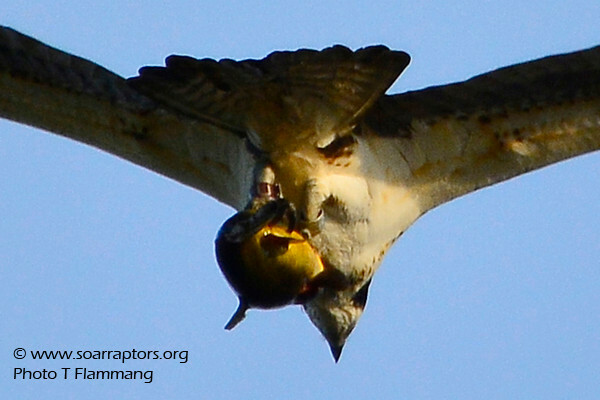 From 2003 through 2014, 164 wild ospreys were produced at 95 successful nests (duplicated locations). Wild hatched osprey may be banded as part of the reintroduction effort and receive a green project band on their left leg and a USFWS silver band on the right leg. 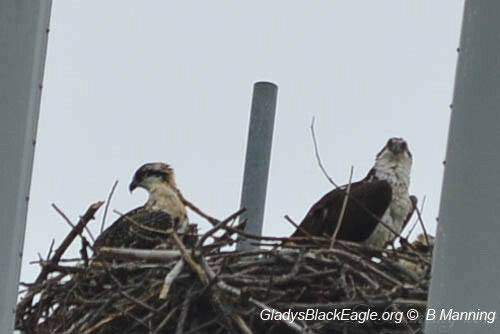 In 2014, 21 osprey pair nested with 15 successful nests producing 30 young. Female Y8 (she was hacked at the Lake Red Rock tower in 2006) along with a mate that fledged three young on a cell tower nest near Des Moines in 2014 will be included in that year’s statistics. In 2013, folks told us they saw Y8 with an Iowa-hatched male (the bird was wearing a green band). In 2014, we have pictures of her with another bird that could also have been hacked from the Lake Red Rock Tower, we just can’t confirm his Iowa band letters (purple band). Thanks to B Manning and C Hansen for watching Y8 that summer, sharing their photos, and helping us figure out the mystery of who is with Y8! After looking at several pictures, we’re fairly sure the project band is a faded purple band CN. 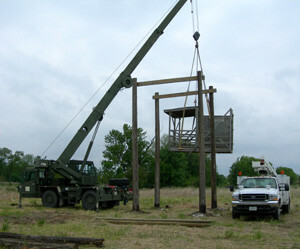 That osprey was hacked from the tower at Don Williams Park near Boone, IA in 2006. One of three young peeking out from mother's wing. Y8 and juvenile (left) in the nest. Preparation - it's almost as if the three young are getting a lesson in take off and landing. The three look really awesome. Thanks to B Manning for watching over them! The female was a little unbalanced. Dad osprey took her and soared with her. Dad and female fledgling soaring high overhead. 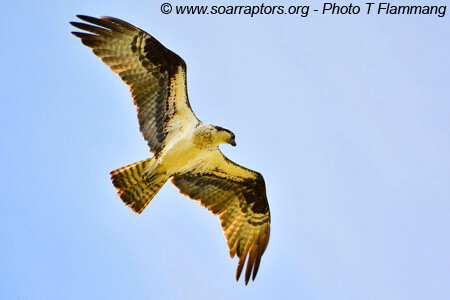 The adult male plays an important role with the upbringing of the young osprey. Double Rainbow at the double towers with Y8 osprey nest. That band is definitely purple and appears to be etched CN. A nice photo of the male with osprey Y8. Thanks to awesome photography we can see a purple project band marked clearly with a C and what could be an N! Y8 mate sits in a tree near the nest. 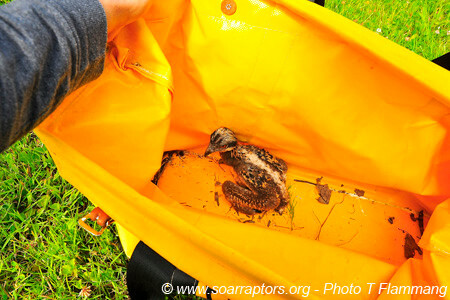 SOAR once again assisted the Iowa Department of Natural Resources Wildlife Diversity Program in collecting young osprey in northern Minnesota for hacking (a special kind of release) in Iowa. SOAR Education Director, Terrie, and SOAR Intern, Trevor were near Brainerd, MN on 11-12 July working with IDNR and the skilled lineman from Allete / Minnesota Power Company to retrieve young osprey from identified nests on utility structures or man-made nest platforms. Chicks are only collected from nests with two or more young. Five young osprey from Minnesota were brought back to SOAR for a complete physical, West Nile Virus vaccination and a few days of monitored feeding. 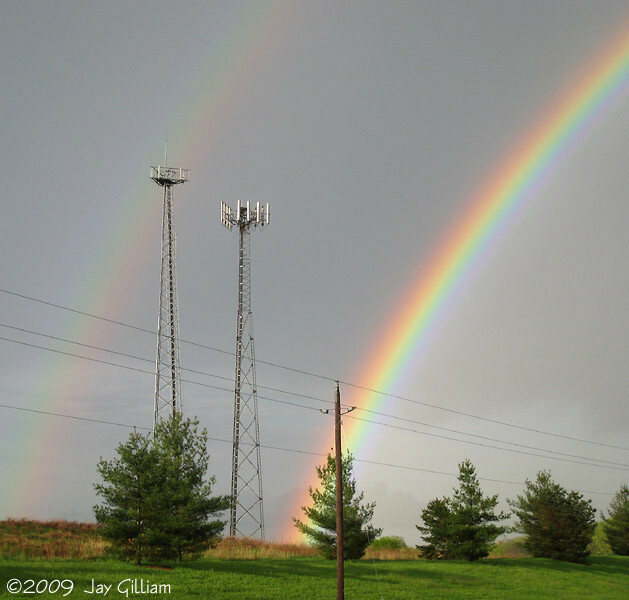 Storms on 16-17 July likely “helped” a young osprey fledge too soon from a nest on a cell tower near Palo, Iowa. A concerned citizen that had been photographing the nest (from a respectful distance) checked the area below the nest on the 17th and found one of the young from that nest. After contact with The RARE Group in Iowa City and with Pat Schlarbaum with Iowa DNR, it was decided to not attempt a re-nesting as it may cause the other two young to also fledge prematurely. This Palo bird will be hacked with the ones from Minnesota. 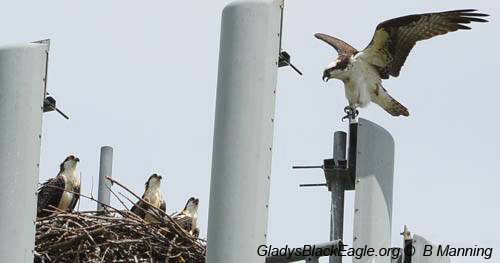 Palo cell tower young and two Minnesota young osprey in Clear Lake hack tower. 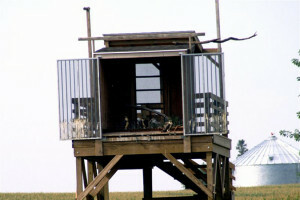 The Palo and two Minnesota ospreys were placed in the hack tower on Clear Lake, Iowa on 22 July. Volunteers (thanks to Ron and his crew) fed the youngsters chunks of fish and kept the water pans freshened. The young osprey need to be in the tower for a few days for the location to become home. These days of relaxing, eating, and hopping about the logs and perches inside the tower help strengthen muscles for that maiden flight. The doors on this tower were opened on 29 July 2016 and Pat and volunteers reported that within 15 minutes of the gates being open, Palo was on the wing! 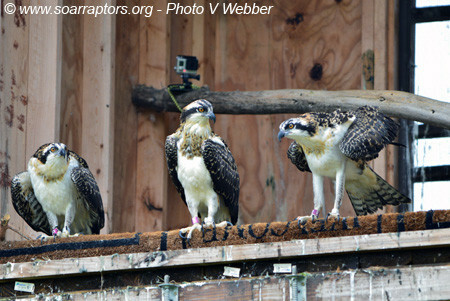 The other three young Minnesota ospreys were placed in the hack tower at Swan Lake State Park on 26 July. SOAR volunteers are providing care for these three. Gates on this tower may be opened on 1 August 2016. **Update… torrential rains in the area have pushed the gate opening to Tuesday, 2 August. 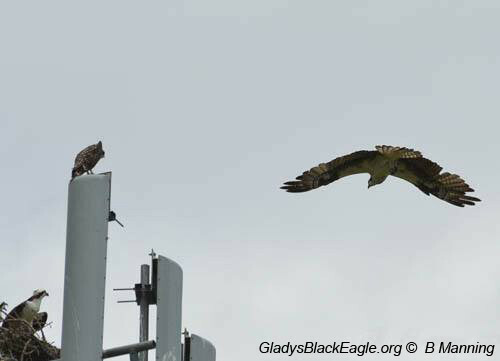 Yes, the gates on the Swan Lake State Park hack tower were opened the morning of 2 August and already one of the young osprey has taken flight. 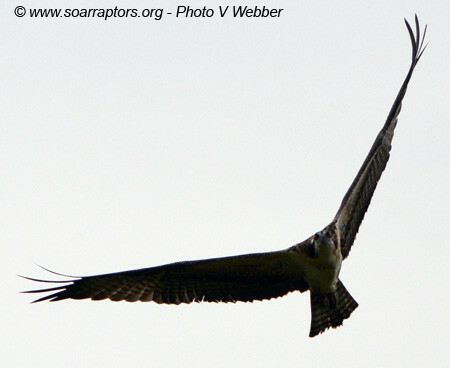 On 4 August, Kay noted that all three swan lake osprey are flying! 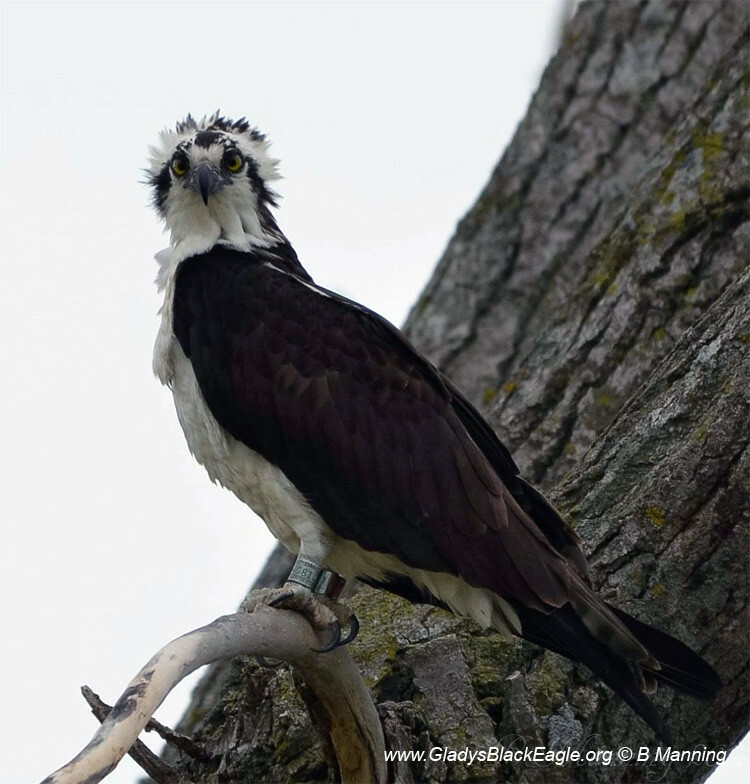 Since 1997, biologists, raptor rehabilitators, and other conservation groups have worked to establish a breeding / nesting population of osprey in Iowa. 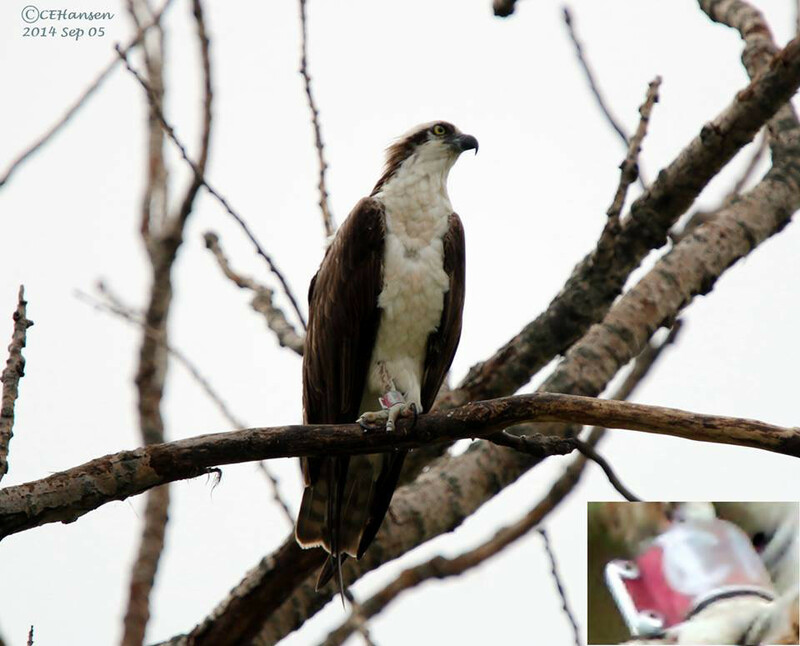 In 2014, 21 osprey pair nested with 15 successful nests producing 30 young. 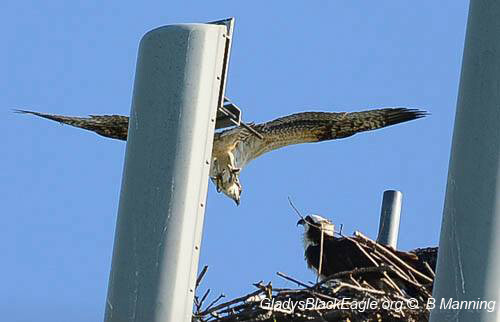 In 2015, there were 22 osprey nest attempts that were known / reported with 18 successful nests that produced 38 young. 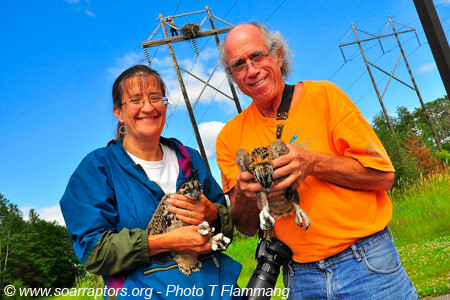 Kay headed to northern Minnesota on 12 July to meet up with Pat Schlarbaum, Iowa DNR Wildlife Diversity Program, and Bill Fraundorf, who leads the osprey collection for Minnesota Power. Red on the radar kept Kay in St. Cloud for the evening. Indeed bad storms hit the area where many osprey nests can be found. 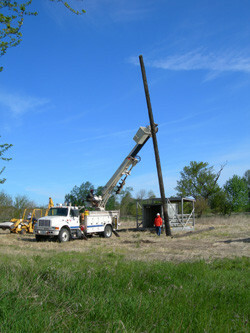 Minnesota Power lineman and crews were busy Sunday evening repairing damage and getting power restored. Needless to say, osprey took a back seat as the usual collection crew from Minnesota Power were sent home to get some sleep. The collection crew found several osprey chicks that had died and were still in the nest and others dead on the ground. They also found several nests with only one chick. Those chicks are left to be raised by their parents. Chicks are only collected from nests with two or more young. 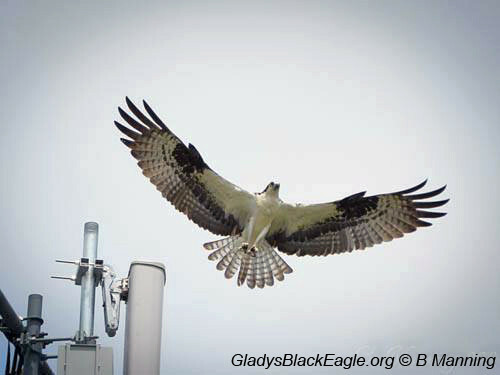 Kay handed one of the lineman her cell phone for a picture from up at the nest, but little did he know he would have a great video of momma osprey defending her nest. 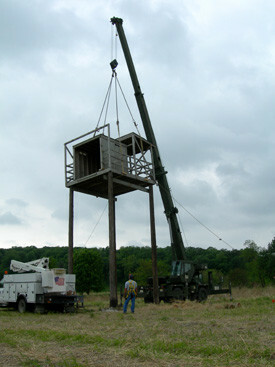 Four of the five osprey were put in the hack tower at Swan Lake State Park in Carroll County on 17 July. 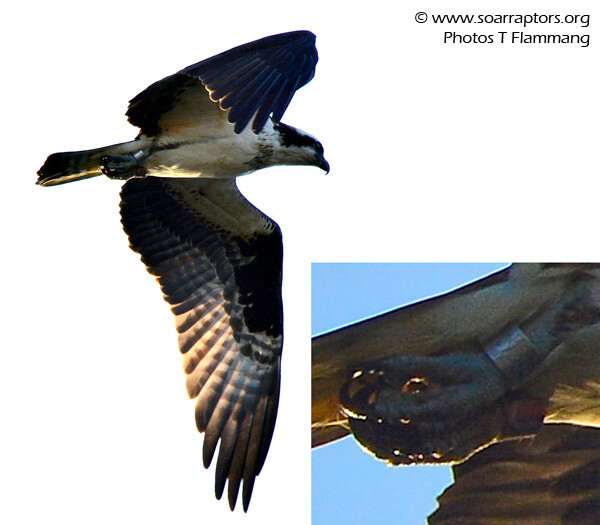 The osprey in the tower have purple bands of: AE, AH, BX, and TY. 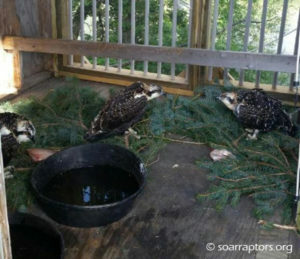 One young osprey needed continued care and stayed at SOAR. These osprey were ready to try their first flight and the gates on the tower were opened on 29 July, at 9:00 a.m. These osprey began their southward journey. Two were seen on the 10th… none afterward, they probably left over the weekend of 12-13 September. Carroll County naturalist Matt noted he saw an unbanded (wild born) osprey cruise through Swan Lake State Park that same weekend, but didn’t stay long. 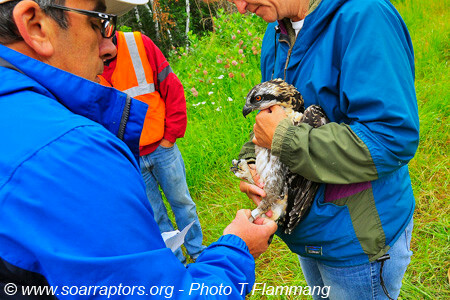 SOAR volunteers went to northern Minnesota on 14-15 July to bring back young osprey for release in Iowa. No more than seven birds will be collected under a US Fish & Wildlife Service permit. Three younger and three older osprey arrived late the evening of the 15th! Thanks to Terrie and Tyler for helping out this year. Once the older three were wormed and received West Nile vaccination, they were placed in the hack tower on Clear Lake on 26 July. 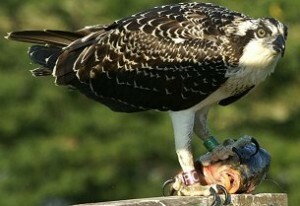 The younger osprey would be hacked at the tower on Swan Lake. 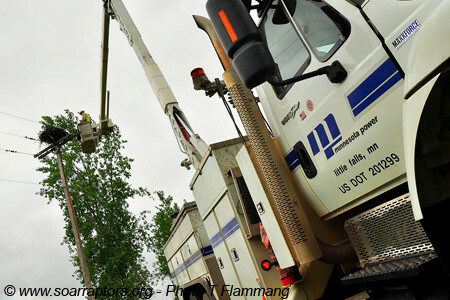 As always, special thanks to Allete / Minnesota Power lineman and their supervisors and Pat Schlarbaum with Iowa DNR for his assistance! Photos below from the 2014 collection event. Six birds were brought back from Minnesota this year. 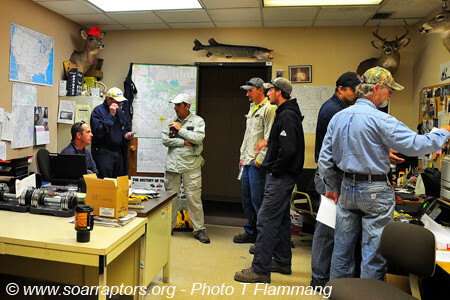 Prepping and safety talk before heading out into the field. 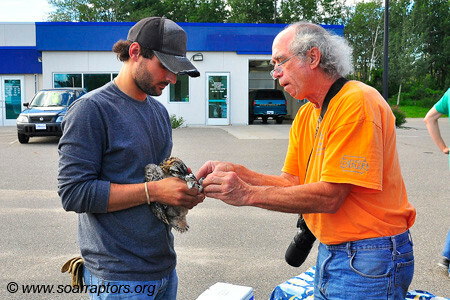 Mark Martell, Minnesota Audubon, selecting a USFWS band for the osprey. Mark bands the osprey while Terrie H with SOAR holds. Mark records the USFWS band number in his records. 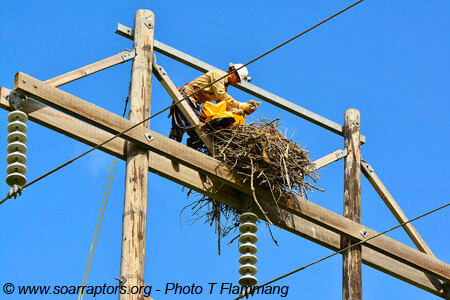 Pat S, Iowa DNR, helps a Minnesota Power employee band an osprey. 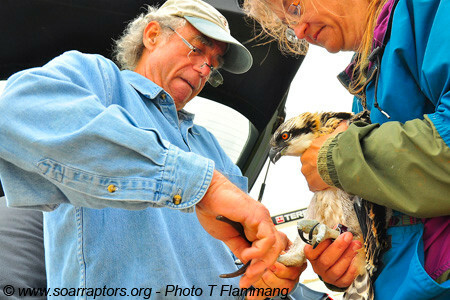 Pat S., Iowa DNR places the federal band on the osprey's leg. 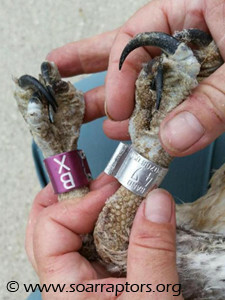 The purple project bands are specific to Iowa released osprey. Some nests were accessible by bucket truck. 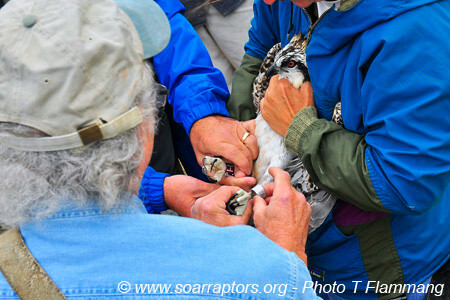 Pat S, Iowa DNR puts bands on an osprey. 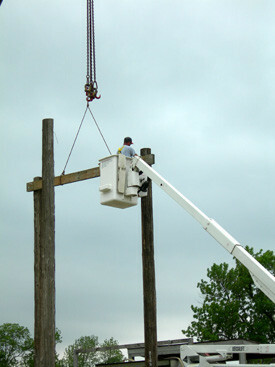 Minnesota Power lineman lowers the basket to the ground. 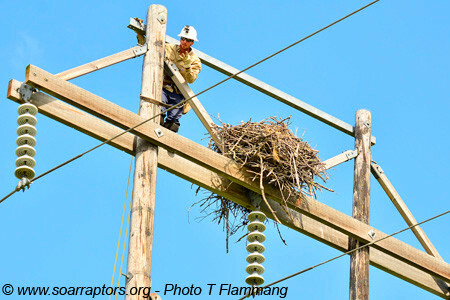 Most nests were only accessible by lineman climbing. Terrie and Pat with two of the collected osprey. Tyler holds while Pat bands the osprey. 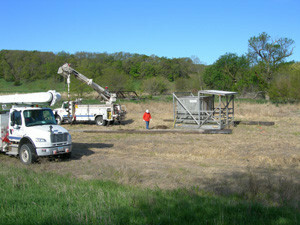 The lineman expect to see adult osprey flying overhead! An adult osprey flies overhead. Notice the distinct crook in the wings. One adult osprey flew in with a new stick for the nest. Adult osprey landing in nest. 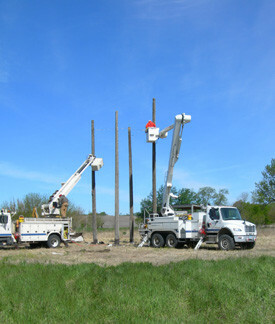 Lineman signals to the ground crew. 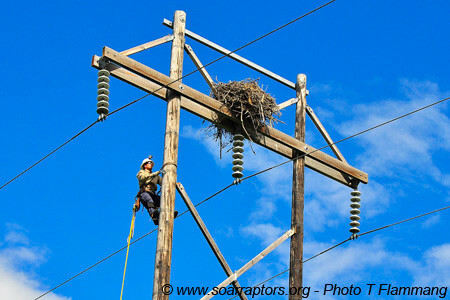 Lineman collects a young osprey. 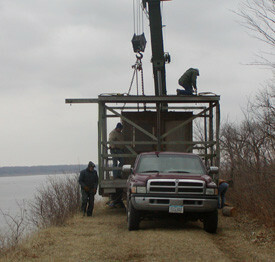 On 4 August, the younger birds were placed in the tower at Swan Lake State Park. Thanks to Carroll County Conservation naturalist Matt and SOAR volunteer Vic for their watchful eye and care and feeding! Project band identification letters for this year are: BV, TP, and BS. The gates on the tower were opened on 29 August and by 1 September, two of the three osprey had ventured out. BS in the tower before the gates were open on 29 August 2014. Jon J unlocks the gates on the hack tower so they can be secured open on 29 August 2014. The gates are open... now what? 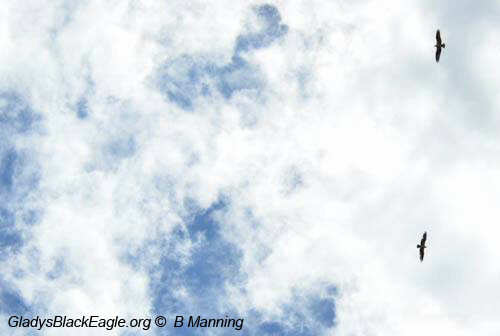 One of the hacked osprey at Swan Lake State Park flies from the hack tower on 29 August 2014. Supplemental feeding stopped on 26 September. 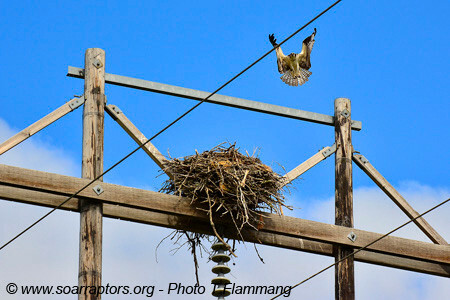 A red-tailed hawk was seen on the nest structure on the following Monday. 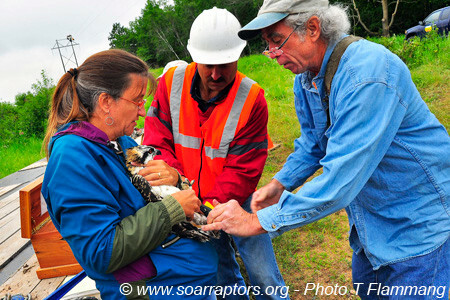 SOAR traveled to northern Minnesota in mid-July to bring back young osprey for release in Iowa. Nine birds in total were taken from nine nests under a US Fish & Wildlife Service permit. Four will be hacked in Dubuque County at Mud Lake. The other five will be hacked in Carroll County. 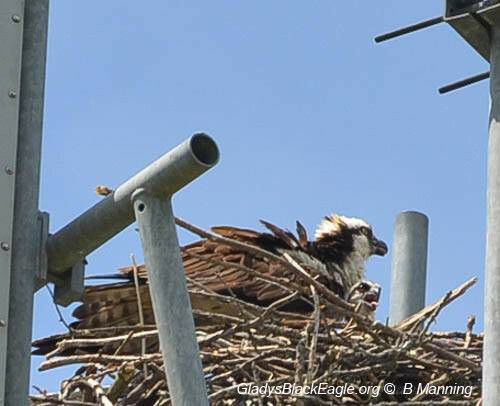 The slide show below features highlights of the 2013 ‘gathering of young osprey.’ As always, special thanks to Allete lineman and their supervisors and Pat Schlarbaum with Iowa DNR for his assistance! The wet and cold weather in northern Minnesota may have impacted when the osprey nested, slightly later than average meaning smaller / younger birds in mid-July. 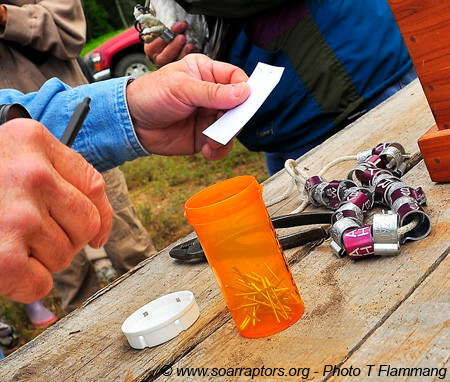 The young birds are given a field exam, vaccinated for West Nile Virus, and banded. Most of the young osprey collected this summer had fly eggs or maggots in their ear canals! Gross! Once the young osprey were back to SOAR, the young are placed with our education osprey so he can serve as a model eater! 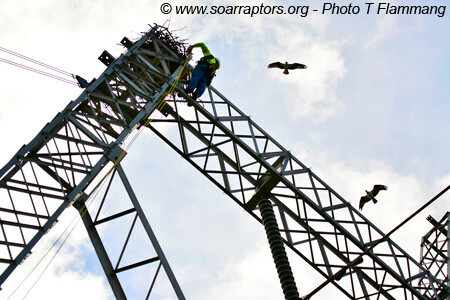 We need to make sure that the young osprey are self-feeding before they can be placed in the hack tower. This year’s birds are not only smaller than many in past years, plus there is a definite age difference! 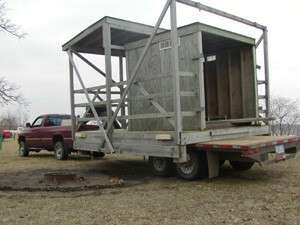 The three biggest osprey were placed in the hack tower at Swan Lake State Park on 24 July (bands BR, BK, and BE). The smaller two osprey were placed in the Whiterock Conservancy hack tower on 9 August (bands BD and BH). On 13 August, Kay, Vic Webber (SOAR volunteer), and Matt Wetrich (Carroll County Conservation) opened the gates on the hack tower at Swan Lake State Park. Vic reported that all look healthy and that none jumped out right away so are happy with where they are at… at least for now! On 19 August, Matt W saw all three Swan Lake State Park osprey on the tower! PLUS… the gates on the tower at Whiterock Conservancy were opened today and BD and BH stayed put. Around 26 September all the young osprey released have left the area. Vic W noted in his final report on the Swan Lake State Park osprey, “It appears that all three have joined the massive migration south, as none of the fish pieces have been touched in the last two days.” At this same time, Kay reported that the two osprey at Whiterock have also left for the year. SOAR is helping with the efforts of Carroll County Conservation staff to hack young osprey from a new tower constructed on Swan Lake. Four young osprey were brought back from northern Minnesota and as in past years were retrieved from the nest by ALLETE / Minnesota Power Lineman. 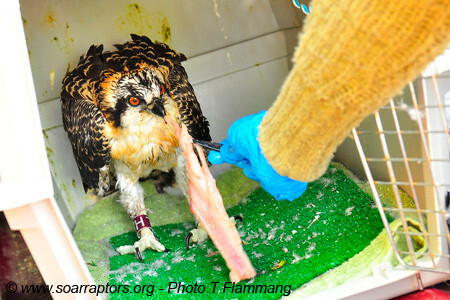 One of the young died while at SOAR and was later determined by necropsy performed by Dr. Dirks that the osprey died from a fungal infection — aspergillosis completely consumed one lung. 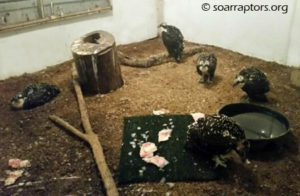 Three young osprey were placed in the hack tower on 17 July. These birds have purple state identification bands: AV, AW, and AX. The gate on the tower was opened on 6 August and by 10 August all birds had left the tower. By 10 September, the young were not coming to the tower to feed anymore. Photos in the slideshow below from Missy, Natalie, Savanna, Kay, Victor, and Megan (and likely others). 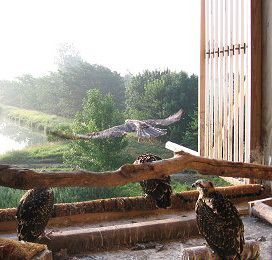 In 2006 SOAR partnered with Whiterock Conservancy to establish nesting osprey along the Middle Raccoon River. Where a young bird learns to fly, tends to be where it chooses to nest as an adult. Young osprey were borrowed from nests in Wisconsin and Minnesota and brought to Iowa. Here they were “hacked out,” an ancient falconry technique of slowly releasing young birds back to the wild from a secure tower structure. They are provided with food and water as they learn how to fly and become proficient hunters. Osprey are neotropical migrants, spending our winter in South America. They are also slow to mature and will not start nesting until they are three or four years old. Nesting structures have been installed at Whiterock ready for any of our returning released birds or perhaps a migrating osprey will see the structures and chose to stay and nest. All Iowa-released ospreys have a USFWS silver identification band on one leg and a purple identification band with a unique alpha-numeric ID on the other leg. 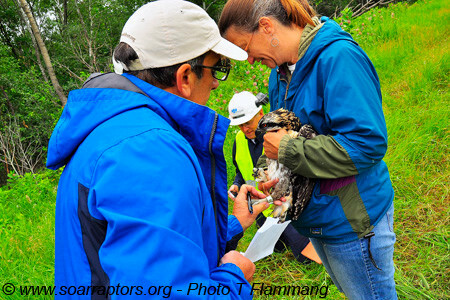 2011 – Lineman from Allete / Minnesota Power retrieved young osprey from nests on 11 July for release in the Spirit Lake area and at Whiterock Conservancy. 2011 band identification ‘numbers’ are: YK, YN, YT, YU, and YX. 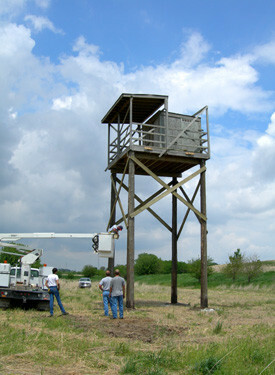 2010 – Pat Schlarbaum with Iowa DNR indicates that Whiterock Conservancy hack tower will have young osprey to release this year. The young osprey will be at SOAR the week of 12 July and Kay placed four young osprey from northern Minnesota in the hack tower on Friday 16 July (2010 band numbers are: UR, UC, UH, and UU.). These birds are older than birds released in past years and UR, UC, and UH didn’t hang around the tower long at all. UU stayed the longest. 2009 – 4 of the 5 birds hacked at Whiterock (bands RN, TJ, PX, RP), bird with band RR was released at Red Rock’s tower. 2008 – Nestlings from a wild osprey nest at Saylorville Reservoir were rescued via boat by Army Corps and Polk CCB staff, just as flood waters were rising over the nest, and taken to SOAR, raised, and hacked along with reintroduction birds. Bands PC and NX were from Saylorville. Birds with bands NT, NE, and NN were from Minnesota. 2007 – ID tags EC, EN, EP, HA, KE, and ER. Osprey EC was found to be not healthy, was removed from the hack tower, and taken back to SOAR for evaluation. EC later died. It was determined that EC died from West Nile Virus. This is the reason we now vaccinate all incoming osprey with at least one dose of the equine WNV vaccine. An adult osprey patient that overwintered at SOAR was also released at the hack tower. 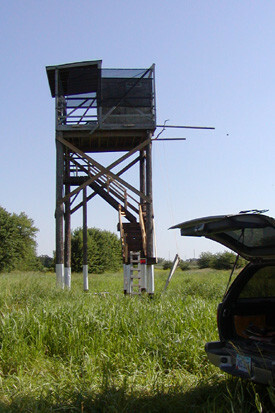 2006 – The original five birds have bands Y9, Y6, AC, AH, and AT and were placed in the hack tower mid-July. On 25 August an additional Minnesota osprey put in hack tower, XF (this is a black band as XF had originally been reintroduced in MN, was injured at his MN release site, recuperated at The Raptor Center and then needed released again). 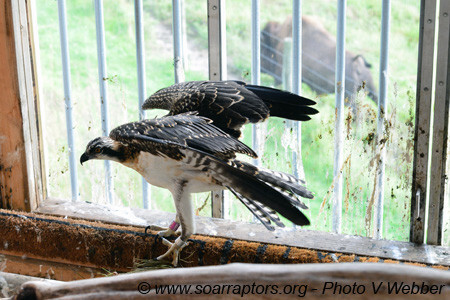 2D was released at tower in early September, also received from The Raptor Center. 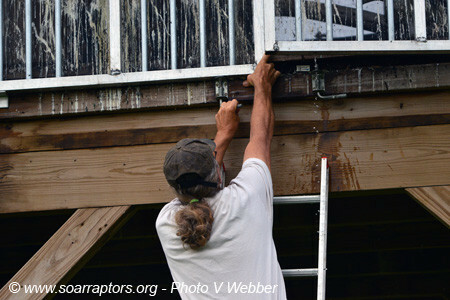 Thanks to all the Whiterock Conservancy Osprey Project donors! 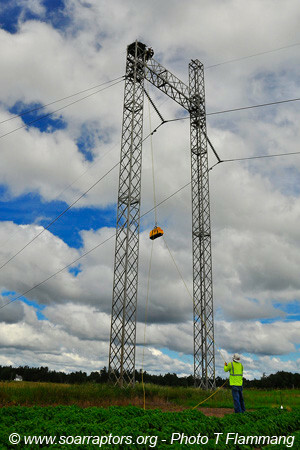 Special thanks to the Linemen from ALLETE/Minnesota Power Company who retrieved the young osprey. Our efforts would not be possible without their expertise and equipment.